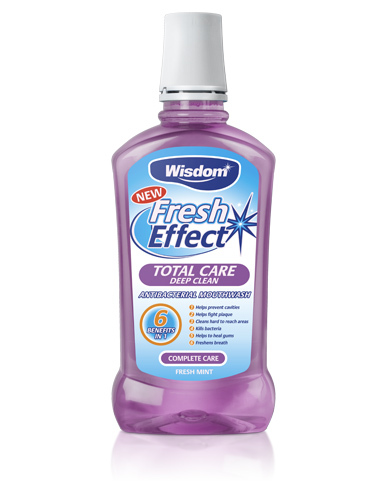 Wisdom Fresh Effect Total Care mouthwash provides 6 oral health benefits in 1 to help keep your teeth and gums healthy. The antibacterial formulation gets into even hard to reach areas for a truly deep cleaning experience. Fresh mint flavour for total mouth freshness. Ingredients: Aqua, Alcohol, Sorbitol, PEG-40 Hydrogenated Castor Oil, Sodium Citrate, Sodium Saccharin, Aroma, Citric Acid, Zinc Chloride, Sodium Hydroxide, Cetylpyridinium Chloride, Sodium Fluoride, Cl 42051, Cl 16035.